The Bulgarian capital of Sofia has an estimated population of just over two million – yet has only thirteen operational ambulances. At a time when the value of our own healthcare system is being constantly debated, and NHS watchdogs such as the Quality Care Commission are finding themselves under constant press and government scrutiny, Sofia’s Last Ambulance (2012) is a stark documentary that couldn’t be more timely. 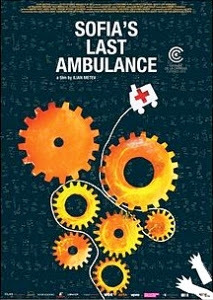 Following doctor Krassimir, his nurse Mila and their driver Plamen, filmmaker Ilian Metev gives us a passenger-seat-view of the daily grind endured by three in-demand ambulance crewmembers. The chain-smoking trio make for curious heroes, but as we see them race through the night from one call to another, we grow to understand that their blithe exteriors mask the despondency that comes with such a futile career path. From traffic incidents to drug overdoses, the team attempt to save as many lives as possible amidst one of Europe’s poorest capitals. This study of a broken system prevailing against insurmountable financial and political odds is, at times, an exhausting experience, causing us to empathise more with their soul-crushing existence than those most in need of their assistance. Rarely witnessing any actual casualties, we focus instead on the effects each near-miss has on the team. Remarkably, there’s still a certain amount of enjoyment to be harvested from these excursions through Sofia’s pot-holed streets. Yet, behind these anecdotes lie three damaged souls, each battered and beaten into submission what they’ve witnessed – and, more importantly, by those they’ve failed to save. Through a number of extreme close-ups of the team’s faces, we learn all we need to know from our protagonist’s drawn expressions. From inaccurate directions through to patients who fail to understand the pressures the team cope under, Sofia’s Last Ambulance certainly grinds you down. With the strains of the outside world only exacerbating the crew’s situation, the night shift we witness seems to have finally broken through the hard exterior each member has built around themselves. The following morning, we ascend into the ambulance’s cab to find one of the chairs empty. Perhaps someone is on holiday, or maybe just sick. Regardless, what was once a film about Sofia’s courageous and dedicated healthcare workers departs as a hopeless hymn for a seemingly incurable metropolis.